Use whatever veggies you have on hand in this flexible vegetable soup recipe! It's easy to make, great for warming up on cold nights & vegan, too. A few weeks ago, I was pretty sick. It’s not usual for me, but I didn’t leave the sofa for three or four days in a row. Jack would bring me veggie soup and crackers, and somehow we started watching Friends – in marathon form – from the very beginning. He doesn’t want his friends and coworkers to know this, but we’re now 3 seasons in, and he couldn’t BE anymore into it. Once I was back on my feet, I was still craving soup, and I had a ton of random veggies to use up. 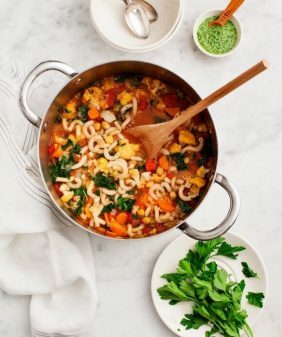 This vegetable soup recipe is a great one to have on hand whenever you crave a healthy, nourishing, vegetable-packed soup. Use whatever vegetables you have on hand and/or skip the ones you don’t have. Make a big pot, eat it the next day, and the day after that. (It also freezes well). 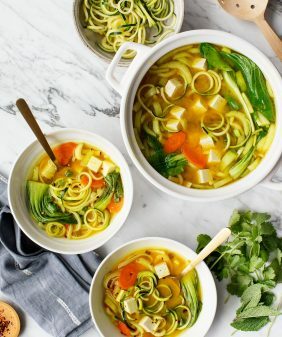 A warm bowl of this vegetable soup is great to cozy up with – especially when it hasn’t been your day, your week, your month, or even your year. 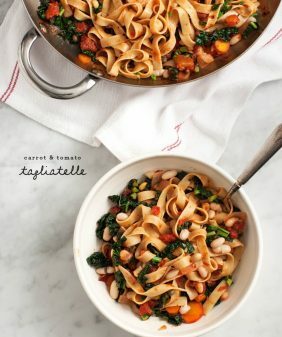 And if you love cooking with many veggies, try these tacos or this roasted vegetable pasta! This flexible vegetable soup recipe is perfect for using up whatever veggies you have on hand! It's a healthy, vegan meal that's great for cool fall and winter days. Heat the oil in a large pot over medium heat. Add the onion, ½ teaspoon salt, and several grinds of pepper, and cook, stirring occasionally, for 8 minutes. Add the carrot and sweet potato, stir and cook 2 more minutes. Add the wine and cook for about 30 seconds to reduce by half, then add the canned tomatoes, garlic, oregano, and red pepper flakes. Stir in the broth and bay leaves. Bring to a boil, then reduce the heat to a simmer and cook, covered, for 20 minutes. Stir in the cherry tomatoes, green beans, zucchini, chickpeas, and cover and cook 10 to 15 more minutes, until the green beans are tender. Stir in the vinegar, kale, an additional ½ teaspoon salt (or to taste), and more pepper. Store extra soup in the fridge for a few days (this one tastes better on the second day). Freeze after that. This looks so beautiful and hearty. And the name? It couldn’t be more perfect! This sounds like a great way for me to clear out my fridge! Beautiful & simple. 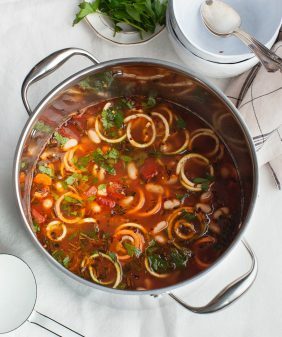 This soup looks so yummy and perfect comfort food! Glad you are feeling better! 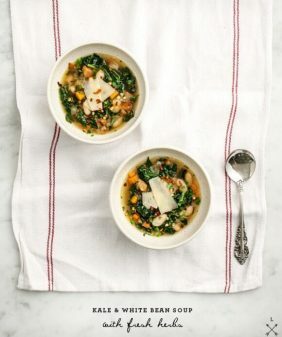 This looks wonderful – I have been in a serious soup mood the past few weeks. Perfect timing. I started eating healthy todayQ! Gonna make this for sure! Thanks! hope you are feeling better…and this soup is exactly the kind of thing you need..also friends is my all time favorite too. 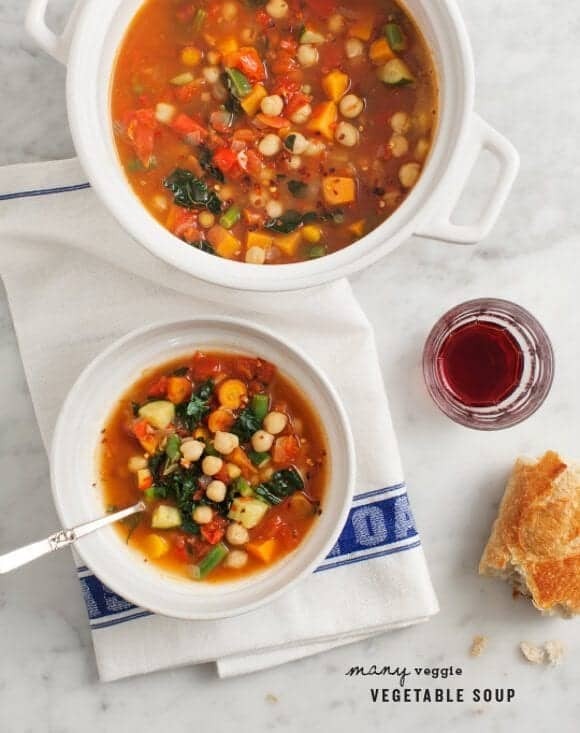 this looks great – I usually start my soup routines this time of year, healthy or sick. Looks delicious! I’m looking forward to trying this – just wondering, what is the volume of the can of tomatoes you used? Hehehe, the Friends song reference made me giggle. Friends is on my list of shows to watch because I have only seen one episode all the way through. In the minds of some of my friends, that is basically sacrilegious. this looks delicious! i’ve been sick myself, and i’ve been wanting to try out a new soup recipe. guess i found it! This looks so comforting. Sometimes a simply flavored bowl of soup is just what we need when we aren’t feeling our best. Love the white wine and balsamic additions here. Sorry to hear you weren’t feeling well! Soup always helps though, and this one sounds fantastic. The more veggies, the better in my opinion! Based on my grandmother’s advice, I steadfastly hold that soup is the best cure for illness (she also says that sticking garlic cloves up your nose is the best cure for a stuffed nose. I will refrain from commenting). This looks like it would do the trick! This is such a great looking soup. 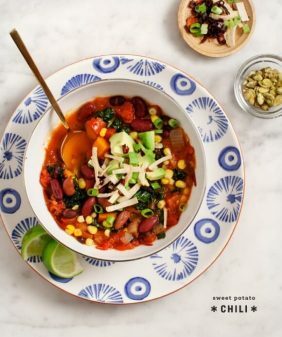 It’s blowing a gale here in Amsterdam and I really need to cuddle up with a bowl of this awesome soup (and my partner!). Thank you for this recipe and all the great advice and recipes on your blog. Glad to read you are back up on your feet as well. Looks very tasty and healthy, great article going to try this tonight! I’ve been craving soup all day, this recipe couldn’t have come at a better time! I love vegetable soup, fully loaded with lots of veggies! Great recipe! Haha! I love how you not-so-sneakily snuck Friends into that last sentence. That show is just irresistible, and perfect for sick days on the couch. Hope you’re feeling better! I love a nice big pot of vegetable soup. So delicious, so satisfying. Must make soon. Made this for dinner last night. DELISH! Kept chicken off to the side for those carnivores among us!! Perfect soup to warm me up Jeanine! Just tried this recipe for dinner last night and it was so great! Very easy to make and has tons of flavor. 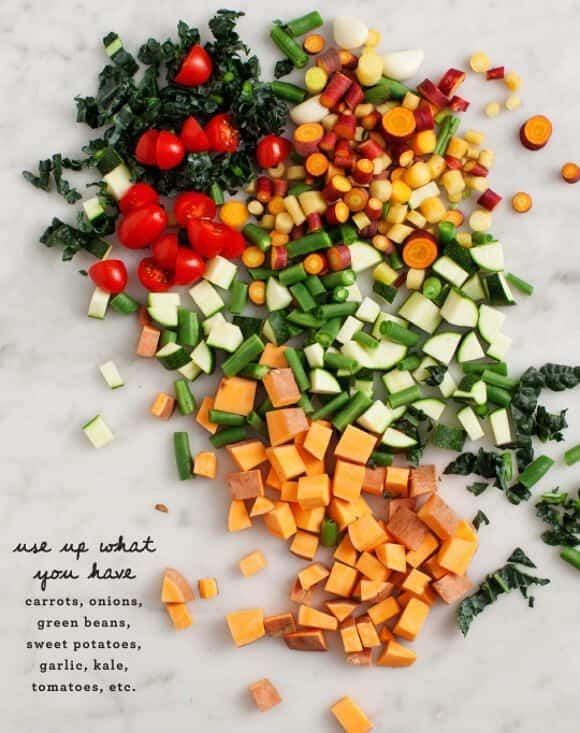 I also loved putting all of the veggies in – makes me feel like I am doing something so good for my body when I eat foods like this. Thanks for sharing! Hi Erika, I’m so glad you liked it! Made a version of this last week and was extremely happy with the results. Used some beef stock out of necessity to un-vegan it, also used canned diced tomatoes with chiles and I liked the kick it gave the soup. Can’t wait to try more of your recipes! Beautiful photography by the way. Hi Bobby – I’m so glad you liked it – i’ll have to try tomatoes with chiles next time I’m in the mood for more of a kick. First time I am commenting. Have been reading your blog and trying your recipes for a while now and this particular one is delish. Have been playing with it and seasonings over the past weeks as you were suggesting and since the weather is getting colder in Paris – and it never disappoints ! Just made this for dinner and it was SO GOOD! this is a great recipe and the fam loved it! This was great! My soups often turn out meh and I thought the flavor of this one was perfect. I used 3 tsp of herbs (2 oregano, 1 thyme) and subbed out the sweet potato and zucc for delicata and butternut. It took more like 20 mins to cook. Just made this soup. It turned out delicious! Question- I want to freeze some of it. Shouldn’t I cool it down now and then freeze it, instead of leaving it in fridge for a day or 2, and then freezing it? I make this soup at multiple times every winter – so tasty and I feel so good stuffing myself full of vegetables. It’s always a great way to use up raclette leftovers!